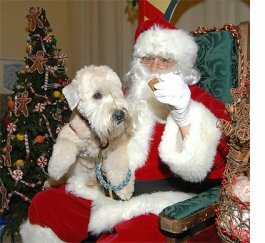 Camp Bow Wow in Kemah is offering pet photos with your pet and the big guy in the red suit December 12 starting at 10am. TIKI Photography will take the photos with Santa with packages available to choose from including a $25 sitting fee and 5 digital images. $5 of the proceeds will be donated to Bay Area Pet Adoptions. Drop your pup off atCamp to play that day and to have pics taken or make an appointment by calling 281-334-2267. Photo provided by Camp Bow Wow Kemah.